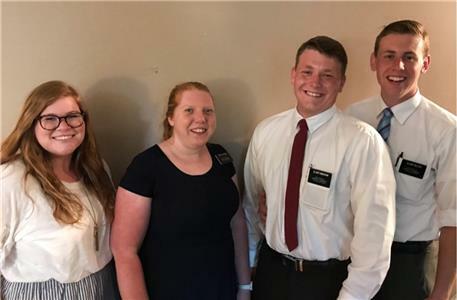 The Chattanooga Valley ward (congregation) of The Church of Jesus Christ of Latter-day Saints, located in Flintstone, Georgia, is hosting four full time Mormon missionaries to help with sharing the gospel of Jesus Christ. The four missionaries are Sister McKenzie Jensen of Vineyard, Utah; Sister Taylor Mansfield of Santa Clarita, California; Elder Reagan Bluth of St. David, Arizona; and Elder Jameson Bingham of Hurricane, Utah. They are between 18-20 years old. Elder Bluth explained that young men leave behind their families and friends while dedicating two years completely to The Lord. “Over the past year, I have learned that Jesus Christ is aware of the trials we face. He knows each of us personally and will give us answers to our prayers. That’s why I’m out here sharing the message of His restored gospel through service and, yes, sometimes by knocking on your door! Jesus Christ is infinitely aware of the trials we face,” he said. “Coming to know Christ as my Lord and Savior fills me with the desire to share His promise – ‘Come unto Me, all ye that labour and are heavy laden, and I will give you rest’” (Matthew 11:28). Elder Bingham said he is also grateful for the opportunity to serve in this area. Missionaries do not request their area of assignment. They receive their assignment from Church headquarters. During their time of service, “contacts with family and friends are limited to letters and occasional phone calls to family at special times. Missionaries avoid entertainment, parties or other activities common to this age-group as long as they are on their missions, so they can focus entirely on the work of serving and of teaching others the gospel of Jesus Christ” (mormonnewsroom.org). The missionary effort of The Church “is based on the New Testament pattern of missionaries serving in pairs, teaching the gospel and baptizing believers in the name of Jesus Christ” (mormonnewsroom.org). Missionaries are not paid for their services, and they fund their own missions, sometimes with the support of family and friends. A mature couple – a mission president and his wife – supervise these young people. Mission presidents come from all walks of life. Among the new mission presidents around the world are “49 businessmen, 20 educators, 11 medical professionals and a professional golfer.” Mission presidents and their wives serve for three years without pay and “supervise and train on average from 170 to 180 missionaries during a given time, and will work with around 600 young people during their three-year period of service” (mormonnewsroom.org). President David Jay Pickett and his wife, Kristin J. Pickett, preside over the Tennessee Knoxville mission, which includes the greater Chattanooga area and parts of Georgia. The Picketts are from Idaho, and are co-owners of Pickett Ranch. The term “Mormon” is a nickname for the Church and its followers. The official name is The Church of Jesus Christ of Latter-day Saints – a name that bears witness that Mormons are followers of Jesus Christ and His restored gospel.